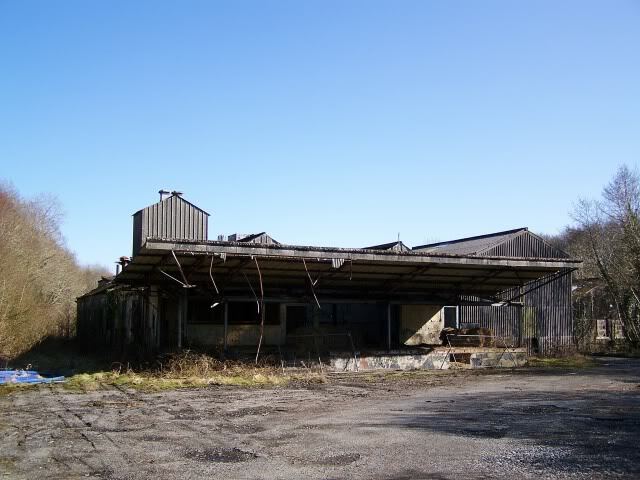 Back in August at a Traws link Cymru meeting, committee member John announced he had an idea, “ how about we clear the old station at Pont Llanio?I know the guy who owns it. It’s not been developed, he uses it for storage” all the members, were enthusiastic about this, so we arranged a site visit. 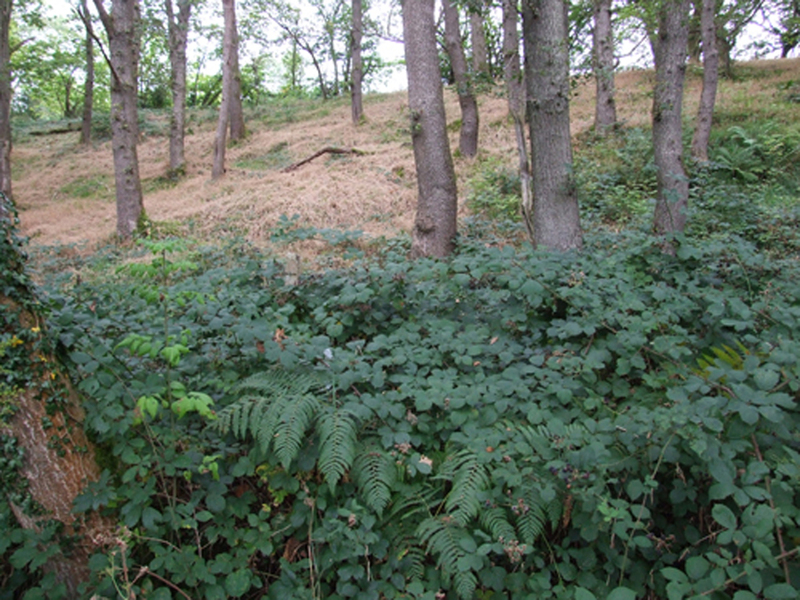 On the 23rd October 2014 we got permission to do an inventory of the site. We arrived in the village of Pont Llanio, not far from Tregaron. It was a early in the morning and nobody was about. We pulled up to the entrance to be met by an enormous abandoned milk factory that dominated the yard as we entered. As soon I saw the building I felt exhilarated. I began to have idea’s for a site specific dance and performance. A multidisciplinary performance incorporating sound, projected visuals, lighting, spoken word, songs and dancers. was very excited! During my research I will be focusing on Pont Llanio I wanted to know, how the factory operated? what had the working conditions been like? Had such milk plants been common? Who had worked in it? When did it close? Was it a directly related to the closer of the line? what were the feelings of the factory workers when was the last freight train was loaded with the milk? When was it’s last run? What was the village like when the factory was going strong? what sounds/noise came from the site? An interesting fact that Ceredigion was known as “very milky Ceredigion” but at one time the people could not afford their own milk to drink or to make into cheese, instead theyhad t sell it to Liverpool or London.This fact made me wonder who remembers drinking the milk that came from Pont Llanio and about the London dairies? I spent such a long time observing and walking in and around the milk factory building that I almost forgot about the platform. The TLC group had already located the platform and it was my turn to discover it. 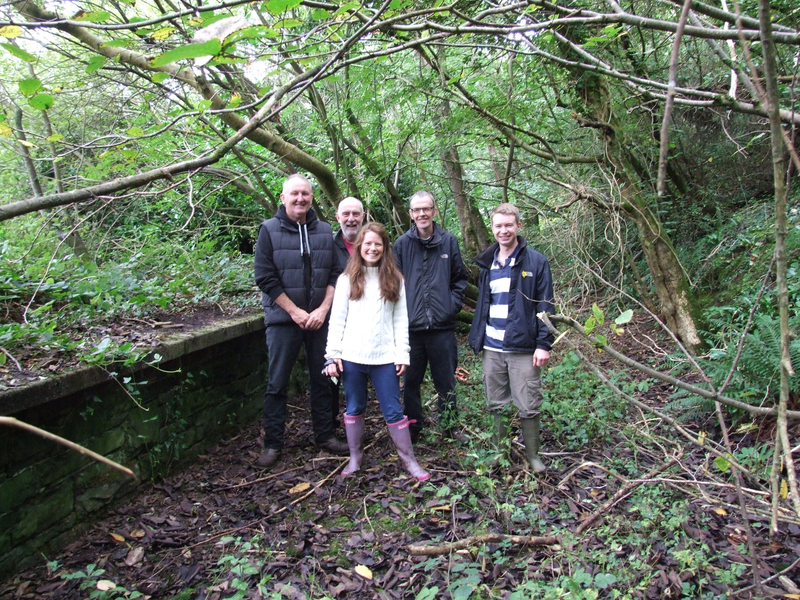 The platform was completely barricaded off with brambles and we had to bash our way through with sticks. 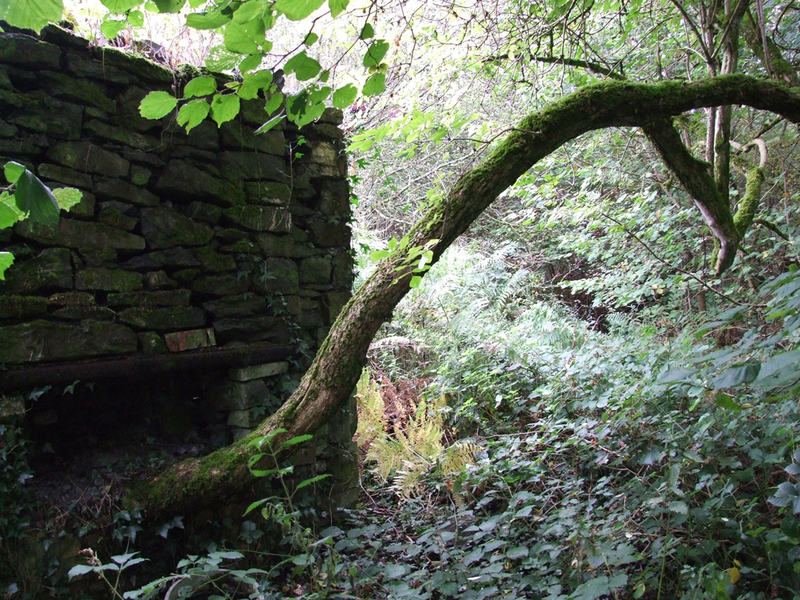 Once through the brambles I entered onto a fully intact platform, with it’s stone top and walls. I felt a huge energy surge, and again ideas for a performance flooded my imagination. Evoking more questions like, what did it look like when it was up and running? what buildings and shelters stood there? who caught the train? Where did it go? was it passenger or mainly freight? I was told that a water tank still survived, and I was eager to see it. We had to walk a little further, bashing more brambles that had overgrown the platform. As I approached, it was the sound of rushing water I first sensed; it sounded strangely like the you were traveling on a train. Then WOW! 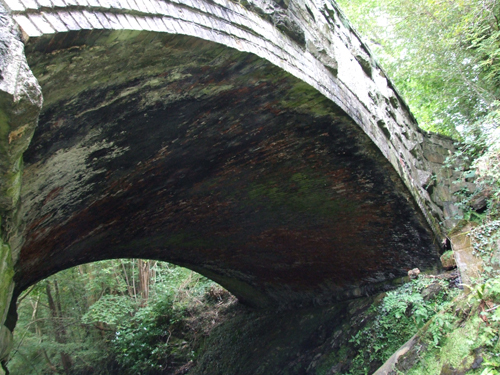 There was this beautiful stone bridge, and then, across the track was the water tank, still holding water. The sound I heard was the water running around the tank due to blocked pipes. 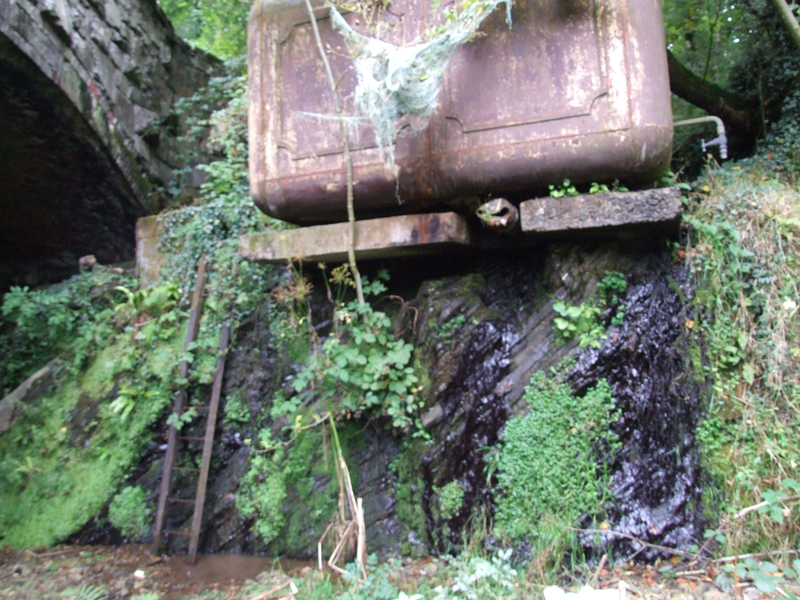 This very elegant water tank used to fill locomotive boilers, and is still standing firm at Pont Llanio. Walking back, a little further up the platform I explored part of the railway track that had been totally reclaimed by nature. Seeds had been blown onto the track, had taken root and were now 40-50 years old high. I was struck by the symbolism of this relating to my project. Like seeds blown in the wind, ideas can take root in peoples minds and imaginations. And how seeds of change and or future growth waiting to emerge from within each and every person. I was happy to see the trees and the thoughts and feelings that sprang from them; however, I was saddened at the prospect of them being cleared, feeling guilty and sorry for what many humans have done to this planet from the overfishing of the sea to the poisoning of the land to climate change. I needed to transform these sad thoughts, into positive thoughts out into my world. What comforted me was the belief that this railway line if reinstated will connect busy towns in Wales with a reliable rail link, reduce the strain on the roads, link north and south Wales, railways are more socially inclusive means of transport. I feel my project research will also look into the symbolism this line has regarding the economy and the necessity for new approach to doing business– a new economy, one that is driven by caring, sharing sustainability rooted in the soil, ideas of ethics and spirituality, not greed and ecocide. A week or so later I met a lecture Dr Louise Ritchie a lecturer in theatre and performance at Aberystwyth University. After our conversation, we both felt that it was a synergistic meeting, as we are both involved in a train project. Louise applied for funding from Strategic insight programme, and we got it! I will be engaging I talks with louise and running workshops with the BA students. More information as and when it develops. Tags: old stations in wales, pont llaniio, Trains | Permalink. Nice site, I often holiday in the area and I have glimpsed the old creamery a few times in passing from the car. I am a railway modeller and I know a bit of history about the line and also about milk traffic in the area so I can supply a few details for you if you would like. The dairy industry was very big in West Wales and still is to some extent. The Creamery at Pont Llanio was just one of many in the area that were served by the railway. Another existed at Green Grove (Felin Fach) between Lampeter and Aberaeron with other examples at Carmarthen and Llanadog. Milk was collected from local farms and chilled before being pumped into special insulated rail tankers for their trip to London. Despite being a commodity, these milk trains were cleared to run at express passenger speeds on the mainlines in order to ensure the valuable cargo got to London before it spoiled. Milk had travelled by railways since the Victorian times but the 1930s saw a big expansion in the industry with rail-served creameries springing up all over Wales and the West-country. Pont Llanio creamery reopened in its current form in 1937, previously it had been a much smaller facility that churned butter. The larger facility at Green Grove was built circa 1951. The creamery did not close down due to the closure of the railway, in fact quite the opposite as the milk traffic was the only thing that kept the line open. The line from Carmarthen to Aberystwyth closed to passengers in 1964 after floods washed the tracks away near Strata Florida. The line was kept open as far as Pont Llanio specifically for the milk traffic from Pont Llanio and Green Grove. In 1970, the creamery switched to transporting their milk by road and the railway line ceased to serve any meaningful purpose and closed down. The photo at the top of the site is a railway enthusiasts special that worked the line in 1970 as a Milk Branches Railtour. It was probably the first time a passenger train had been down those tracks since the floods in 1964. As far as I can tell, Pont Llanio seems to have been a buttery and actually received milk inwards by rail with butter and dried milk being the outgoing products. Hope this is useful in your project. A few corrections re dates.The line from Aber to Carmarthen was breached by the river Teifi on 12th December 1964 near Llanilar.This closed the section as far as Strata Florida.Trains continued to run south from Strata Florida to Carmarthen until February 22nd 1965, when the whole line closed to passenger trains (apart from the odd excursion)The actual last train ran on 20th February 1965 and was hauled by two Hymek diesel locomotives. Hi, My name is John Gray, My father Jack Gray was born in London House LLandewi Brefi as was my Grandmother, and I am related to a host of people in that area. 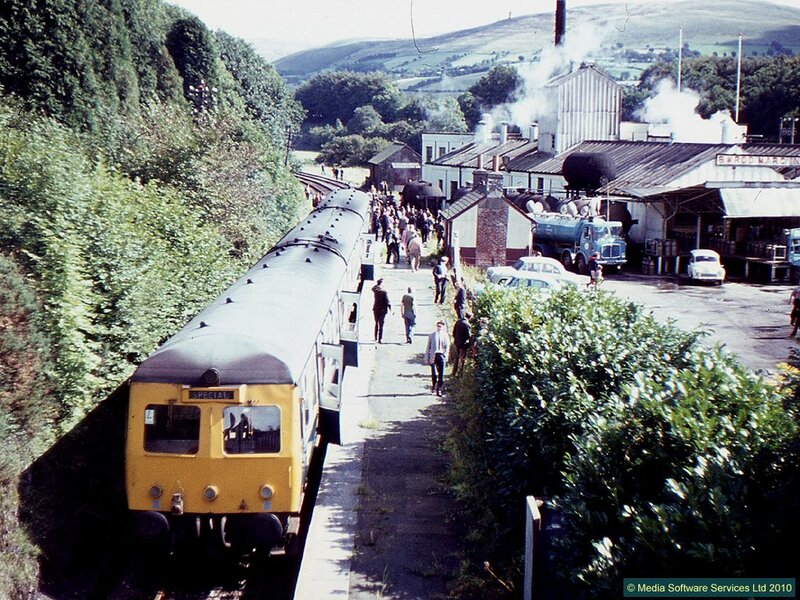 I used to travel up to Pont LLanio station every summer (a relative Dewi was often the train driver) I would have visited first in 1952 and continued though to the 1980s when my parents had moved to the House on the other side of the bridge – Maes- y- Deri in the 1970s. I came up in the age of steam…the milk factory could be heard for miles with it’s ‘chunk…chunk…chunk’ of the machine lifting the lids off the churns. Most of the London dairies were also run by relatives from the Tregaron and Pont Llanio area. There was a canteen at the right hand side of the MMB buiding where we local kids would but chocolate, crisps and drinks, Fishing for trout was excellent by the waste pipe as the water was warm and the discharge rich with nutrients. I stayed in the original house at Ysgoldy Pont Llanio by the chapel and often played in the fields alongside the river and the railway. If Dewi was driving the train, he would often stop to say hello…much to the astonishment of the passengers!! Somewhere in the field by the factory is the old Humber Super Snipe that I used to get a lift in (if I timed in right) from the coalyard to Llandewi chapel on a Sunday. I am now 68 and most of the characters of that time are long gone. Jack Jones the station master used to meet me from the train and wait with me until somebody collected me for the walk to Ysgoldy. I had photographs from that time .but sent them to my daughter in Sweden. Next time I am there I will see if I can dig them out. Good luck.